We welcome you to our home, part shop, part bar and part tasting/events space. 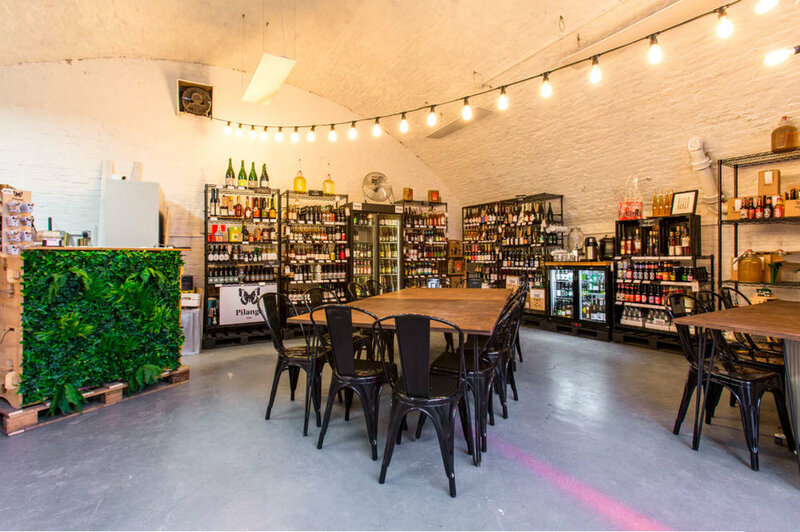 Our cider vault is a hub for the cider lovers of London and beyond. Based in a former London taxi workshop, lovingly refurbished, we have a beautiful arch under the District Line on Munster Road, Fulham. We are home to one of London’s largest collections of craft cider. All products that are available on our online shop are available in store to buy whether you like to drink in or take away. See the full online range here and for our current list of specials, ciders available by the glass or carafe take a look through our menus below. We also host a wide variety of events and experiences including our legendary bottomless cheese boards on a Friday night, cider making workshops and tasting evenings. For details of what’s on next see our events page. 150+ British and international ciders to enjoy in our cosy bar or to take away. The chance to sample an ever-changing selection of unique ciders. Cider tasting evenings, cider making classes and workshops, new product launches and chances to ‘meet-the-maker’ of your favourite brew. We have a constantly changing selection of Ciders available by the glass, for a sample of this see our menu – though we often change them each week. Our in store experts can help you match ciders to wines and beers with similar profiles as well as pairing them to food. Fancy a cider a little like a Sauvignon Blanc, a Pinot Noir or even a Prosecco, just ask! Maybe some Cider to go with a Sunday Roast, Curry or even Avocado on Toast? No problem! Our friendly, knowledgeable staff are on hand to answer any questions you have. NOTE: We will be closed for Easter and Xmas Bank Holidays.